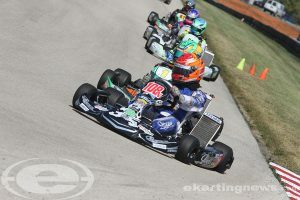 Championship Sunday commenced under extremely hot at the Autobahn Country Club facility in Joliet, Illinois for the United States Pro Kart Series. The eighth and final round of the 2017 championship program completed Sunday with temperatures in the 90s. Thankfully, with the year-end awards ceremony scheduled at the end of the day, the event was shorter than Saturday, including a Prefinal and Final for all six categories competing on the day. In the end, seven championships were decided and seven title winners crowned. Securing the championship with his sweep performance on Saturday, Alex Bertagnoli continued his run at the front of the Switch Racing Engines KA100 division. The Franklin Motorsports / Merlin driver went unchallenged throughout the day to record a second sweep on the weekend, his third on the season. Both main events, Bertagnoli ripped off the fast lap of the race on the penultimate lap, this time clearing the field by three tenths of a second for fast time. He held a near six-second advantage after 18 laps at the checkered flag. Behind him was a battle for second. Round Four winner Mike McAndrews (Fullerton) kept pace with Bertagnoli early on, however, drifted back as the pace went away. A group gradually caught him, led by Round Three victor Brandon Jarsocrak (KSNA / Praga). Once around, McAndrews did not slip away and fought back. McAndrews was able to secure the second spot for his second best finish of the season, as Jarsocrak finished third. Josh Hotz (Franklin / Merlin) came under pressure for the fourth spot from TJ Koyen (Innovative / Exprit) on the final circuit. Hotz defended the spot, and was able to reach the checkered flag in that position while Koyen got jammed up, and eventually lost two spots, dropping to seventh behind Michael Paterno (Kosmic) and Jeff Lyda (Merlin). Jarsocrak finished the season vice-champion with McAndrews third, Koyen fourth and Hotz fifth. 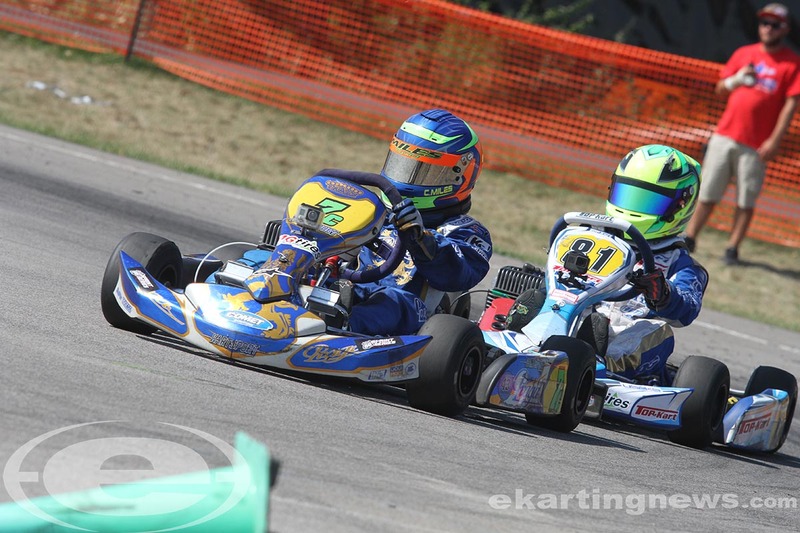 Brandon Jarsocrak (KartSport North America / Praga) completed the same task as Bertagnoli in the Franklin Motorsports IAME Pro division. Jarsocrak backed up his sweep on Saturday with another on Sunday. Jarsocrak went untouched for his third straight sweep on the season, and sixth victory, ahead at the checkered flag by just over two seconds. Bertagnoli (Franklin / Merlin) drove to second with Lane Vacala (CompKart) earning his first top-three finish of the season. Armin Cavkusic (Franklin / Merlin) drove to fourth ahead of Stephen Dial (Merlin). Bertagnoli was second in the standings with Dial placing third as the top rookie. 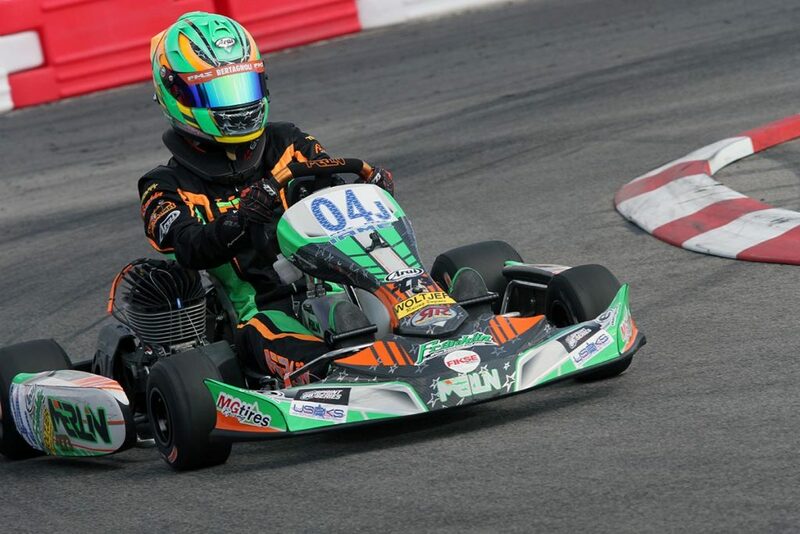 Dario Cangialosi (Tony Kart) finished the year fourth in the standings ahead of Cavkusic. 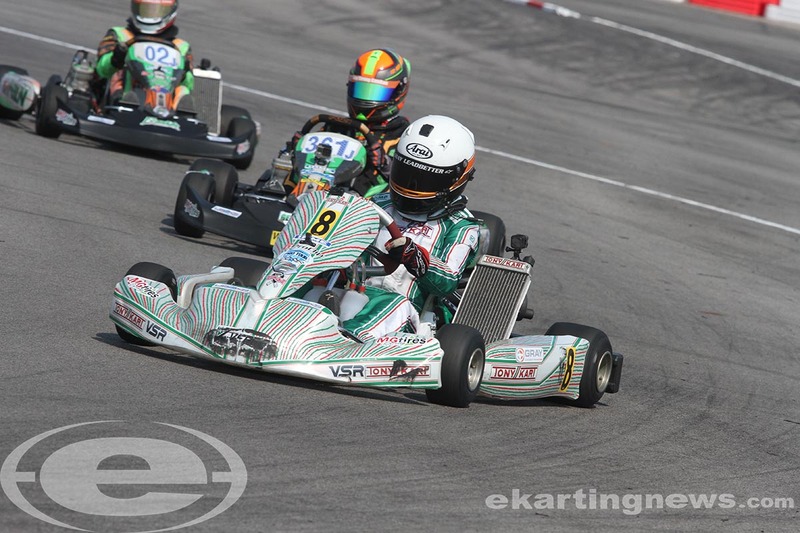 The Woltjer Racing Engines IAME Junior division was a fight to the very end on Sunday. Matthew Northrup (Exprit) ended the weekend sweep for Austin Schaff (Merlin), posting fast time in qualifying. They were battling for the lead about halfway in the Prefinal when the two made contact. Northrup was unable to continue with Schaff continuing on, but placed behind Northrup in the results. Their contact allowed Colin Neal (Vemme) to take the lead in the Prefinal until he was run down by Kyle Thome (Merlin). Thome took the lead on the final lap, scoring the race win. Gray Leadbetter (Tony Kart) finished third, and was the lead contender in the Final. She took over the lead in the main event on lap six with Neal shuffled back. Championship leader Maks Kowalski (Merlin), Schaff and Northrup moved up into the lead group. Kowalski was able to work past Leadbetter on lap 15 with Schaff up to third as they took the white flag. Schaff made an amazing move, diving from third to first in turn one. The move bottled up the group, with Leadbetter able to get the best exit and emerge with the lead. She was able to hold on through the final circuit to secure her first USPKS victory, becoming the first female driver to win in the category. Thome was able to come across the line in second with Schaff in third. Northrup had fast lap of the race, placing fourth with Neal able to finish fifth. 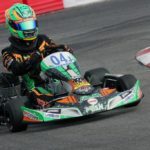 Championship leader Kowalski was given a five-second penalty for bumper infraction, dropping him from fifth to seventh, however, there were enough points to claim his first USPKS championship. Schaff ended the year second with Neal in third. Leadbetter’s victory helped her to move up to the fourth spot with Northrup in fifth. The Allison Racing Engines Mini Swift category was a wild one in terms of the on-track battle and fight for the championship. Brent Crews (Nitro Kart) held the advantage in the chase over Santiago Trisini (Benik) by 38 points when factoring in the drop race. Trisini, the point leader after New Castle, struggled in the qualifying session, ending up sixth in the session while Crews gained 10 bonus points for posting the fast time. Crews had the Prefinal in hand until lap eight when he lost the chain. That put Keegan Bosch (Merlin) in the top spot, scoring the race win while Trisini was up to third behind Jace Park (Parolin). Trisini and Crews would find themselves together at the front in the Final. Crews knifed his way through the field, reaching Trisini as the two jumped up to first and second by lap 13. Park and Bosch tried to hold their ground against the championship drivers for much of the race with Park trying his best for his first victory. Into second on the final lap, he attempted to work past Trisini in the final corners. The door was shut, and Park slowed a bit. This allowed Bosch to slip alongside in the last turn, with the two making contact. That allowed Trisini to reach the checkered flag first, earning his third victory of the season. Crews slipped past Park and Bosch to take the runner-up spot. Bosch slipped to fourth with Mateo Rubio-Luengo (Benik) making the jump up on the final day of action, earning a podium finish in his Mini debut. Bosch ended up fourth with Annie Rhule (Energy) in fifth. In the end, the title was decided by only nine points with Crews holding on for the championship. It was his second title in two years, scoring the Micro crown a year ago. Trisini settled for the vice-champion position, ahead of Nicholas Terlecki (Merlin), Rhule and Jacob Graham (Nitro Kart). 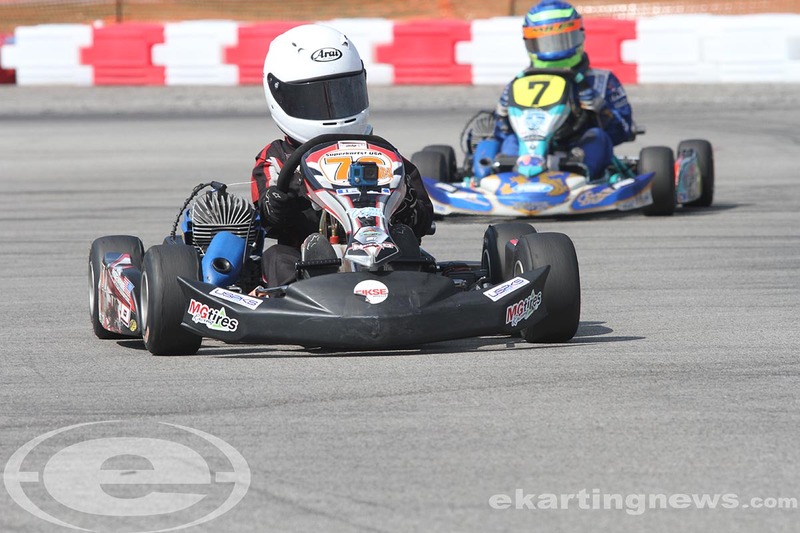 Mateo Rubio-Luengo (Benik) secured the championship in the Merlin Kart Yamaha Cadet division Saturday, sitting out the action on Sunday. Christian Miles took advantage, scoring the victory on the day. It was a battle with Saturday winner Zach Collins (Top Kart). The two led the way throughout the main event with Miles at the point for the majority. Collins slipped past Miles as they took the white flag. Miles waited until late in the lap, moving inside at the final corner, and the two went side by side to the checkered flag. At the line, Miles edged out Collins by four thousandths of a second. Prefinal winner Alex Grapsas (Tony Kart) beat out Annie Rhule (Energy) for third with Dru Lyda (Merlin) placing fifth. Miles finished the standings in second over Rhule, Sebastian Ng (Nitro Kart) and Bayne Bennett II (Tony Kart). On Saturday, Mateo Rubio-Luengo (Benik) locked up the Innovative Performance Micro Swift title and the 10-year-old moved up to Mini for the day, similar to what last year’s champion Brent Crews did at the series finale in 2016. Frankie Iadevaia (Nitro Kart) took advantage and swept the day. He was challenged by Christian Miles (Formula K), who was unable to make a charge for the win in the main event. Sebastian Ng (Nitro Kart) ran third with Ben Maier (Nitro Kart) and Ava Dobson (Merlin) completing the top-five. The win helped to put Iadevaia into the second spot of the championship chase, ahead of Ng and Miles with Maier in fifth. The L&T Clutch Yamaha Junior class did not run on the weekend with zero entries, however, the top two drivers in the championship were recognized. James Lynch (Tony Kart) grabbed his first USPKS championship with Colin Neal (Tony Kart) in second. After the third event of the season, championship leaders in the IAME classes earned a ticket to compete at the IAME International Final in Le Mans, France this October – Brandon Jaroscrak, Maks Kowalski, and Santiago Trisini. Brent Crews earned an entry spot following the Liberty Grand Prix in Pittsburgh and thus, joining the Team USA squad for the October 9-15 event. Following the year-end tabulation of the points, those who did not earn an IAME ticket were in the running for the Superkarts! USA SuperNationals 21 entry tickets and guaranteed starting spot in the SuperSunday main event. 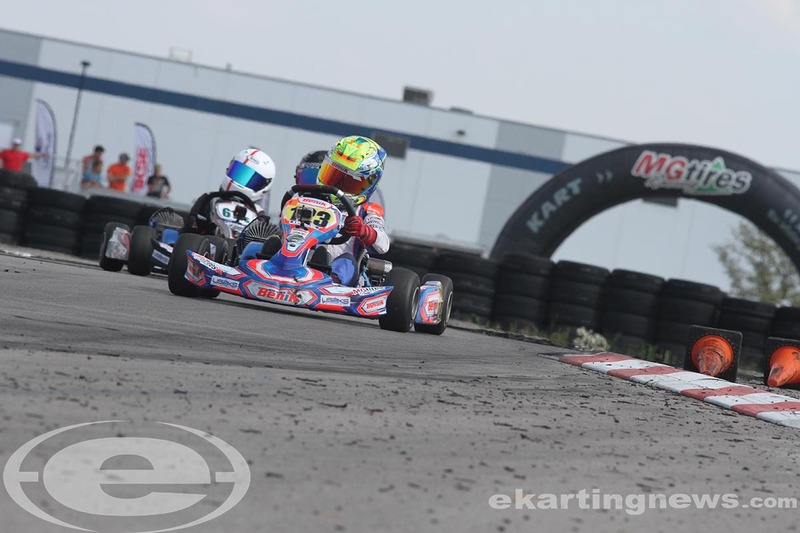 Alex Bertagnoli (IAME Pro), Austin Schaff (IAME Junior), Nicholas Terlecki (Mini Swift), Mateo Rubio-Luengo (Micro Swift) and Brandon Jarsocrak (KA100 – racing X30 Senior) all earned those prizes for the November 15-19 event in Las Vegas.